Bucktown, that little section of Metairie just outside New Orleans, has always played a special role in my trips to New Orleans. It’s hard to believe, but it was more than three years ago when I wrote about stopping at Deanie’s on the way back to Jackson. However, for as many times as I’ve crossed the threshold of the seafood market, I don’t ever remember eating at the restaurant side of the Deanie’s building. In retrospect, I imagine it’s much the same situation as Middendorf’s. A place I’ve always meant to try but with New Orleans proper so near, why eat there? Well, as I remedied that situation with Middendorf’s, I recently had a chance to eat at Deanie’s. An old friend from college, Lisa, and her boyfriend, Chris, were in town for a wedding and it didn’t take any arm wringing for me to drive down to Nola for a weekend reunion. After a po-boy lunch and traipsing through the quarter, we were all getting a bit hungry and Chris had crawfish on the mind. Since I rarely eat boiled crawfish in New Orleans, I was stumped as where to go. The Big Fisherman first came to mind, but that left us without a place to eat. I eventually remembered that Deanie’s had a restaurant in quarter and so we walked to Iberville. Once there, we experienced a bit of a rude awakening. Not only was there a 30 minute wait, the crawfish were $9 a pound. In the midst of a powwow about whether this venture was worthwhile, I remembered the Deanie’s in Bucktown. A quick phone call revealed a much more reasonable $4.95 per pound price and even with the cost of gas; it was still a better deal. One short walk to the hotel later, we were in my car and driving down 90 to Bucktown. As we pulled into the Deanie’s parking lot, I saw a sign for “pinch-a-palooza” which turned out to be a crawfish eating contest. Sadly, the party was winding down as we walked in, but as I would soon realize, that “pinch-a-palooza” might have played a larger role in dinner than I initially imagined. Before we would get to the crawfish, I thought it was time to try a little bbq shrimp. 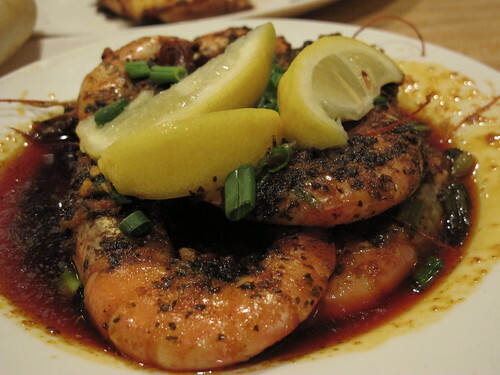 Covered in garlic and herbs, Deanie’s didn’t cut corners on the size of their shrimp. On its own, the sauce was oily and made for dipping. 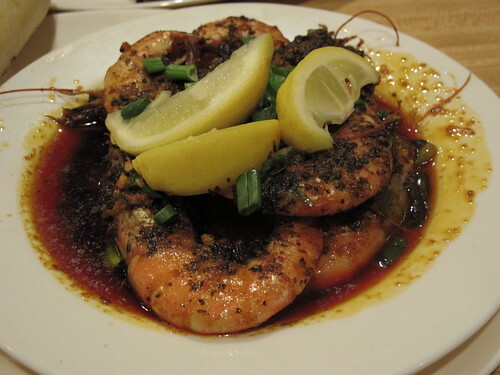 When it came to the shrimp, Deanie’s did well. 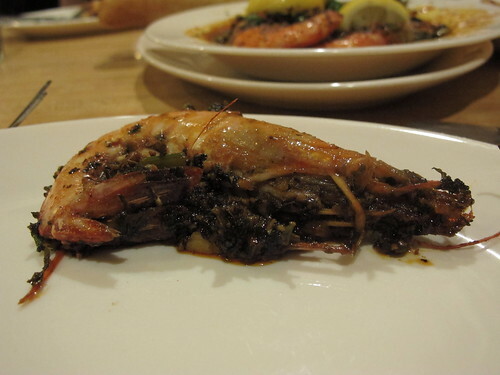 Each shrimp was well cooked with a big, briny flavor that was complimented by the sauce. Chris and I were barely halfway through the shrimp and berating for Lisa for adopting an “I won’t eat food with faces” stance when the crawfish arrived. For late April, I was expecting slightly larger crawfish, but what was most surprising was the taste and texture of this crawfish. Tough from overcooking, cold and dominated by lemon and coriander, I can only guess that these crawfish were left over from the “pinch-a-palooza”. While they did have a decent, lingering heat, the spiciness wasn’t enough to overcome the fact that these were subpar crawfish. 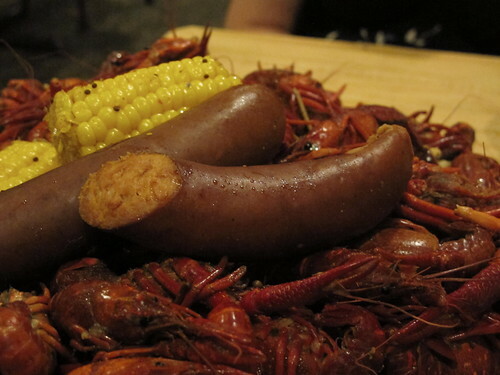 The side of sausage seemed to have fared better than the crawfish with each piece punctuated by a crisp snap of the casing and a rush of crawfish boil flavor. 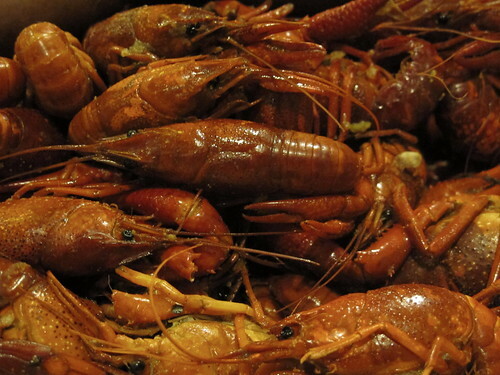 Even with such poor crawfish, we didn’t drive all the way to Bucktown to skip dinner. So, with Lisa looking on and occasionally making faces and comments about crawfish being equal to puppies, Chris and I soldiered through this order of crawfish. 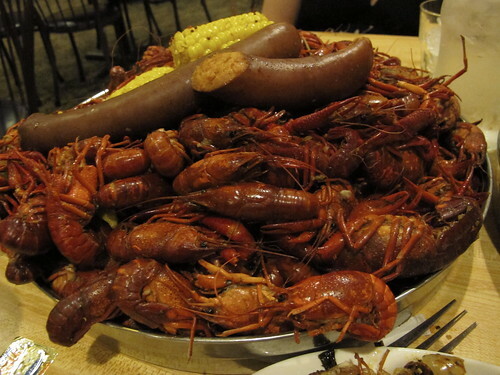 As Chris so eloquently summarized, these weren’t particularly good crawfish but crawfish are still crawfish; an empty platter at the end signified that even a meal of poor crawfish is better than none at all. I would hope that when there isn’t an all day crawfish party, Deanie’s would serve a better product, but in the meantime, it looks like I’ll stick to the market side of the Deanie’s building.